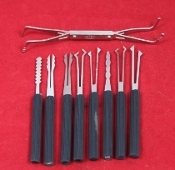 The GOSO 14Pc Dimple Lock Pick Set is specially designed to pick dimple locks. Made of high quality armor plate, this set includes 13 tools for dimple locks and 1 quick-opener. The handles are constructed of easy grip pastern. These specially designed lock picks are an excellent way to expand your locksmith tools.